In the Kidneys and Osmoregulation unit we will learn how the kidney's maintain homeostasis, the ability of the body to maintain a stable internal environment despite a changing environment. We will learn how the kidneys maintain the volume of body fluids., maintain the balance of salt ions in body fluids and excrete harmful nitrogen-containing molecules, such as urea, ammonia, and uric acid. We will also learn what happens when the kidney does not function properly. All animals excrete nitrogenous waste products and some animals also balance water and solute concentrations. 11.3 U 1 ​Animals are either osmoregulators or osmoconformers. List three example osmoregulator animals and three example osmoconformer animals. 11.3 U 2 ​The Malpighian tubule system in insects and the kidney carry out osmoregulation and removal of nitrogenous wastes. Osmoregulation is a form of homeostasis whereby the concentration of hemolymph, or blood in the case of animals with closed circulatory systems, is kept within a certain range. When animals break down amino acids, the nitrogenous waste product is toxic and needs to be excreted. Arthropods have circulating fluid, known as hemolymph, that combines the characteristics of tissue fluid and blood. In insects, the waste product is usually in the form of uric acid and in mammals it is in the form of urea. Insects have tubes that branch off from their intestinal tract. These are known as Malpighian tubules. 11.3 U 3 ​The composition of blood in the renal artery is different from that in the renal vein. Both arteries and veins (in the renal system or anywhere else) are types of blood vessels. Arteries carry blood away from the heart; veins return blood to the heart. 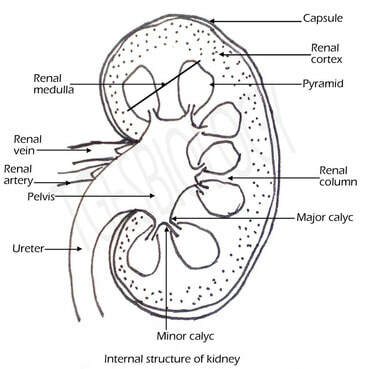 NOTE: the kidney is the filter of the body - thus the substances that need to be removed from the body are present in higher amounts in the blood vessel entering the kidney (the renal artery). 11.3 U 4 ​The ultrastructure of the glomerulus and Bowman’s capsule facilitate ultrafiltration. Ultrafiltration is the non-specific filtration of the blood as it enters the Bowman’s capsule of the kidney in which hydrostatic pressure created by the high pressure in the glomerulus (capillaries) forces a liquid against a semi-permeable membrane. 11.3 U 5 ​The proximal convoluted tubule selectively reabsorbs useful substances by active transport. While ultrafiltration is non-specific with regards to the molecules that leave the blood (based on size, no specific channels), selective reabsorption in the proximal convoluted tubule (PCT) is very specific with regards to the molecules that are reabsorbed. By the end of the proximal tubule all glucose and amino acids and 80% of the water, sodium and other mineral ions have been absorbed. 11.3 U 6 The loop of Henle maintains hypertonic conditions in the medulla. The role of the loop of Henle is to create a solute concentration gradient in the medulla of the kidney. The descending loop of Henle is permeable to water but impermeable to salt ions. The ascending loop of Henle is permeable to salt ions but impermeable water. As the filtrate flows up the ascending loop Na+ ions are pumped out of the filtrate into the interstitial fluid of the medulla thus increasing the solute concentration in the medulla. As the filtrate flows down the descending loop (before the ascending loop)water flows out of the filtrate into the interstitial fluid of the medulla by osmosis following the concentration gradient creating by pumping Na+ ions out of the ascending loop. Therefore the medulla has a very high concentration of Na+ ions; maximum level in humans is 1200 mOsm (milliosmole). This system is countercurrent because the flow of the filtrate in the descending and ascending loop is in opposite directions. This allows for a greater concentration gradient to be created in the medulla. The filtrate now leaves the loop of Henle and enters the collecting duct where the water level is fine tuned. 11.3 U 7 ​ADH controls reabsorption of water in the collecting duct. If the solute concentration in the blood is too high, osmoreceptors in the hypothalamus sense this and signal the pituitary gland to produce a hormone called ADH (anti-diuretic hormone). ADH causes special pores called aquaporins in the collecting duct to open, allowing water to be reabsorbed back into the blood, thus making the blood more dilute. If the solute concentration in the blood is too low, osmoreceptors in the hypothalamus sense this and signal the pituitary gland to reduce its production of ADH. This causes the aquaporins in the collecting duct to close, keeping the excess water in the filtrate, which excreted as dilute urine. This is called osmoregulation. 11.3 U 9 ​The type of nitrogenous waste in animals is correlated with evolutionary history and habitat. 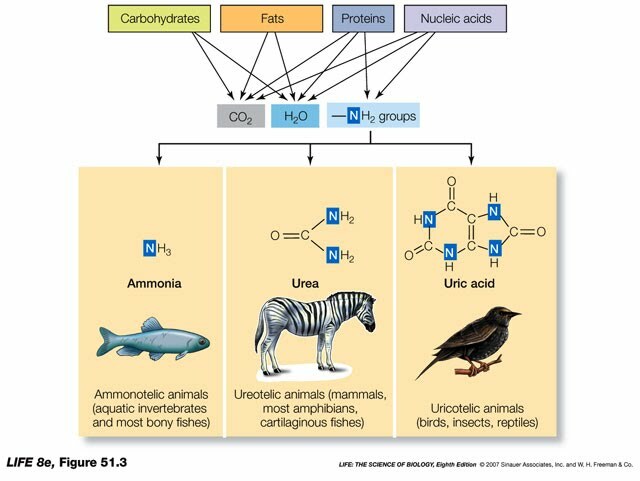 When animals breakdown amino and nucleic acids, nitrogenous waste is formed in the form of ammonia. Ammonia is highly basic, toxic and can be very reactive. Marine and freshwater organisms can release the ammonia directly into the surrounding water. Terrestrial organisms convert ammonia into a less toxic form (urea or uric acid) before excretion. What form depends on the animal's evolutionary history and habitat. 11.3 A 1 ​Consequences of dehydration and overhydration. 11.3 A 2 Treatment of kidney failure by hemodialysis or kidney transplant. 11.3 A 3 ​Blood cells, glucose, proteins and drugs are detected in urinary tests. 11.3 S 1 ​Drawing and labelling a diagram of the human kidney. 11.3 S 2 ​Annotation of diagrams of the nephron. Even though you probably don't choose to spend a lot of time thinking about it, your pee is kind of a big deal. Today we're talking about the anatomy of your urinary system, and how your kidneys filter metabolic waste and balance salt and water concentrations in the blood. We'll cover how nephrons use glomerular filtration, tubular reabsorption, and tubular secretion to reabsorb water and nutrients back into the blood, and make urine with the leftovers. This is the second tutorial in the Renal Anatomy series. This video explores the anatomy of the Nephron, and its component elements. Describes the structure of a nephron, including the Bowman’s capsule and glomerulus, convoluted tubules, loop of Henle and collecting duct. Is 'water intoxication' a real thing? If you've ever worked for awhile in the beating sun, you might know what it feels like to be dehydrated. What's going on inside your body? We all know that we need things like water and oxygen to live, but what happens when you get too much of a good thing? I'm hoping to educate people about the donation process from the donor's perspective. I had so many questions about what my life would look like post donation and it was very difficult to find answers. By sharing my story and my family's story, I hope more people consider becoming a donor because they know have these answers and realize being a donor doesn't have to slow them down.